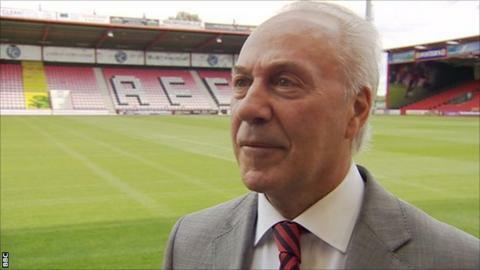 Bournemouth chairman Jeff Mostyn admits nervousness is creeping around the club as the prospect of promotion to the Premier League draws closer. The Cherries have a one-point advantage over Norwich and Watford at the top of the Championship, and are two points clear of Middlesbrough, in fourth. Victory in all three remaining games will seal a top-flight place for the first time in Bournemouth's history. "We're on a high, understandably," Mostyn told BBC South Today. "There is an amazing amount of euphoria but at the same time there is a huge nervousness around." Bournemouth host Sheffield Wednesday and Bolton before travelling to Charlton on the final day of the season and Mostyn is taking nothing for granted. "There is everything to play for," he said. "We've done so well this season and the big prize is within touching distance - I think that's why everyone is so nervous." Cherries' captain Tommy Elphick has told his team mates they must devote their lives over the next two weeks to the club's promotion battle. Bournemouth kept up that chase with a 1-0 win over Reading on Tuesday, with Elphick also hailing their defensive effort. "Clean sheets win championships and if you do then you have a chance of winning games," Elphick told BBC Radio Solent. "It's been a huge effort to get to this point and we've just got to do everything we can to help ourselves recover. "We've got to give up our lives up and focus, three tricky games and three wins will see us win the league - so that's the aim."